You can get up to $20 (with one AmEx credit card), when you use your registered card at participating Esso stations. Only the first 20,000 eligible Canadian American Express Consumer and Small Business Cardmembers to be successfully registered are eligible for this offer. Registered cards linked to active Speedpass accounts as the form of payment are eligible for this offer. Each registered Card is eligible for two (2) statement credits of $10 (CAD) during the offer period. American Express Corporate Cards and American Express Gift Cards are excluded from this offer. • Your account must be in good standing. • You must register in the registered Card offer from October 7, 2015 at 12:01 a.m. (EST) ending November 30, 2015 at 11:59 p.m. (EST) or when 20,000 registrations have been reached. 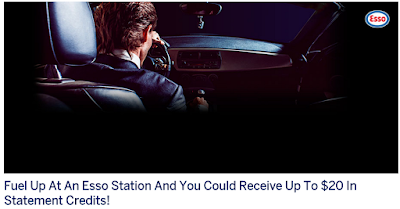 • Use your registered Card at participating Esso stations to make qualifying purchases during the offer period between October 7, 2015 and November 30, 2015. • Purchases made during the offer period prior to registration of your eligible Card in this program are not qualifying purchases. Looks like this offer might now be open to all AMEX cards. I was able to register with my AMEX Gold Rewards, SPG and SimplyCash cards. YMMV and Good Luck! After registration, I got a message: "Thank you for registering! You’ve successfully registered your Card. Next, make up to 2 separate eligible purchases of $50 or more, on your registered Card, between October 7, 2015 and November 30, 2015. For a full list of participating Esso locations, please visit esso.americanexpress.ca. ", and a confirmation email.